Alain Traore's stunning late free-kick defeated Ghana and sealed third place in the Africa Cup of Nations for Burkina Faso. From the right of the 18-yard box, Traore hammered a left-footed effort into the top corner of the net. Jordan Ayew, Edward Agyemang Badu and Bernard Tekpetey all missed chances for the Black Stars, who were made to pay by Traore. 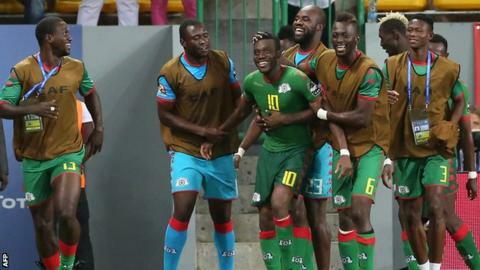 It was a measure of consolation for Burkina, who were denied a place in the final by a penalty shootout defeat by Egypt. Egpyt meet Cameroon in Sunday's final. Match ends, Burkina Faso 1, Ghana 0. Second Half ends, Burkina Faso 1, Ghana 0. Attempt missed. Daniel Amartey (Ghana) with an attempt from very close range is close, but misses to the right. Assisted by Christian Atsu with a cross following a corner. Corner, Ghana. Conceded by Kouakou Herve Koffi. Attempt saved. Jonathan Mensah (Ghana) right footed shot from outside the box is saved in the bottom left corner. Assisted by Daniel Amartey. Attempt missed. Emmanuel Badu (Ghana) left footed shot from the centre of the box misses to the left. Assisted by Thomas Partey with a cross. Attempt blocked. Ebenezer Ofori (Ghana) left footed shot from outside the box is blocked. Foul by Steeve Yago (Burkina Faso). André Ayew (Ghana) wins a free kick on the left wing. Goal! Burkina Faso 1, Ghana 0. Alain Traoré (Burkina Faso) from a free kick with a left footed shot to the top left corner. Substitution, Burkina Faso. Adama Guira replaces Charles Kaboré. Bertrand Traoré (Burkina Faso) wins a free kick on the right wing. Foul by Jonathan Mensah (Ghana). Foul by Blati (Burkina Faso). Asamoah Gyan (Ghana) wins a free kick in the attacking half. Charles Kaboré (Burkina Faso) wins a free kick in the defensive half. Foul by Emmanuel Badu (Ghana). Substitution, Burkina Faso. Patrick Arnaud Malo replaces Yacouba Coulibaly because of an injury. Delay in match Charles Kaboré (Burkina Faso) because of an injury. Foul by Bakary Koné (Burkina Faso). Asamoah Gyan (Ghana) wins a free kick in the defensive half. Cyrille Bayala (Burkina Faso) wins a free kick on the left wing. Foul by Thomas Partey (Ghana). Attempt missed. Bertrand Traoré (Burkina Faso) left footed shot from outside the box is close, but misses to the right. Attempt saved. Cyrille Bayala (Burkina Faso) right footed shot from the left side of the box is saved in the centre of the goal. Assisted by Prejuce Nakoulma. Corner, Ghana. Conceded by Issoufou Dayo. Attempt missed. Alain Traoré (Burkina Faso) left footed shot from outside the box is too high. Assisted by Blati. Substitution, Ghana. Christian Atsu replaces Jordan Ayew. Offside, Burkina Faso. Blati tries a through ball, but Prejuce Nakoulma is caught offside. Substitution, Burkina Faso. Cyrille Bayala replaces Aristide Bancé. Blati (Burkina Faso) wins a free kick in the attacking half. Foul by Jordan Ayew (Ghana). Substitution, Ghana. André Ayew replaces Bernard Tekpetey. Attempt missed. Jonathan Mensah (Ghana) left footed shot from the centre of the box is too high. Assisted by Jordan Ayew with a cross following a corner. Corner, Ghana. Conceded by Yacouba Coulibaly. Foul by Charles Kaboré (Burkina Faso). Emmanuel Badu (Ghana) wins a free kick in the defensive half. Foul by Prejuce Nakoulma (Burkina Faso). Daniel Amartey (Ghana) wins a free kick in the defensive half.